as it varies engine speed and air intake opening to meet the demand for compressed air. Because of the great variety of throttle control and pressure-regulating devices used with compressors, detailed instructions on their adjustment and maintenance should be obtained from the manufacturer's maintenance and repair manual. When a control valve fails to work properly, disassembly and a thorough cleaning are necessary. Some control valves are fitted with filters filled with sponge or woolen yarn to prevent dust and grit from entering into the valve chamber and to remove gummy deposits that come from the oil used in the compressor cylinders. Replace the filter with the specified material each time a valve is serviced. Do NOT use cotton as a filter element as it will pack down and stop the airflow. Air compressors are protected against ingestion of dust and foreign particals by air cleaners. These maybe oil bath or dry-filter type. The filtration system maybe a single falter serving both the power source and the air compressor, or each unit may have an individual filter. 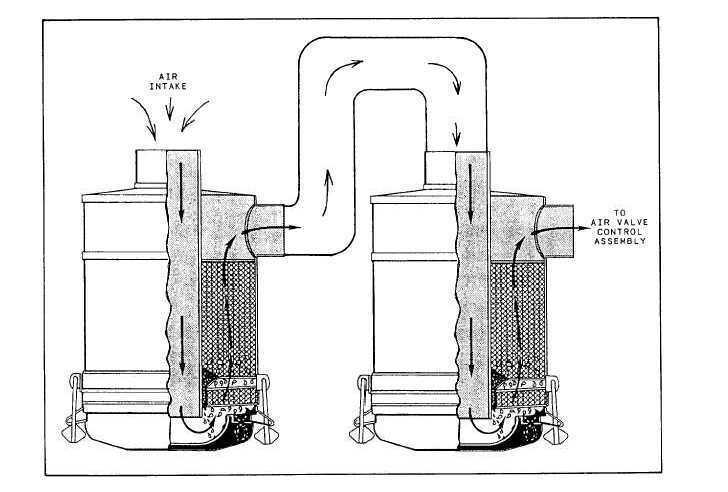 Larger air compressors working in dirty conditions may use a two-stage system (fig. 8-11). In most cases, the falters are the same as those used on automotive and construction equipment engines, just larger. Figure 8-11. - Two-stage, oil bath, air filter system.